I’ve always enjoyed reading a good scary tale, and in my opinion short stories make the best medium for leading the reader through the “valley of fear.” Don’t get me wrong, I have enjoyed many horror novels over the years, but my favorite stories have always been short ones. That’s largely because they, by necessity, get right to the point and waste no time leading the reader right smack dab into the middle of the monster’s den. 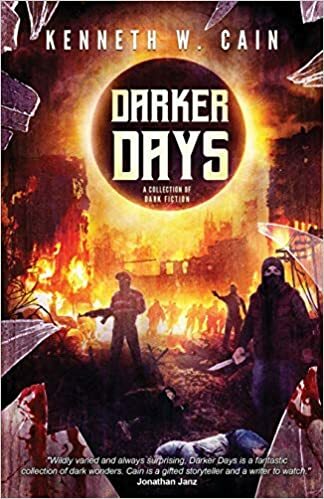 Darker Days, by Kenneth Cain, is a great collection of tales that any fan of horror fiction would enjoy. There’s something in this book for everyone. The subject matter of the tales therein includes ghosts, cosmic horror, zombies, vampires, weird creatures, aliens, kaiju, and demons. While there were stories I enjoyed more than others, there wasn’t a single dud in this collection. As I read through Cain’s stories, I found myself enjoying his style of writing. He does a good job of describing the setting and action without a lot of needless exposition. One thing I’ve never cared for is when a writer drones on for two pages describing what could be summed up in two sentences, and Cain avoids that nicely. Probably my favorite story in the collection is “By the Crescent Moon“. This one tells the tale of Mike, who has just moved into a house in the North Carolina countryside. The story works for me in several ways. There’s the trope of the dark, foggy night, with something strange lurking out there. It ties in with folklore, especially Welsh legends that touched the New World. Throw in a creepy old woman who possesses knowledge of the legends and lore of the area, and who tries to warn Mike against venturing out into the hills on that foggy night, and you’ve got the setting for a really creepy tale. Of course, Mike shuns her advice and things go to hell fairly quickly. But hey, if people acted with good common sense and clear rational thought, there would be no scary story. There would just be the tale of the guy who heeded advice and went back home, locked the door, and went to bed. And who wants to read that story? All in all, Darker Days is a solid set of stories that should entertain most any horror enthusiast. For my part, I look forward to reading more of Cain’s work. Next time you’re looking for a good scary read, you won’t go wrong grabbing a copy of this book.